The vector stencils library "Bank UML package diagram" contains 5 shapes for drawing UML package diagrams. 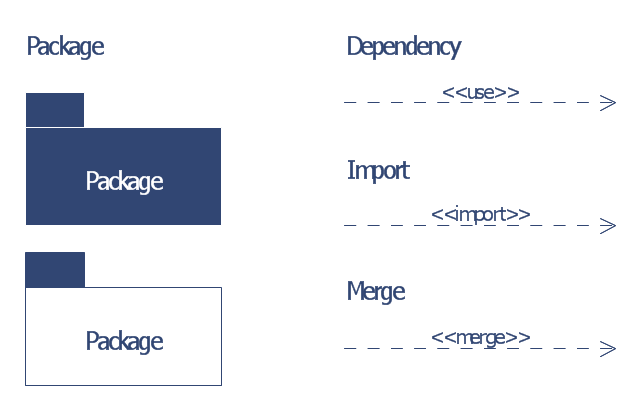 "A package diagram in the Unified Modeling Language depicts the dependencies between the packages that make up a model. 1. Package: a general purpose mechanism for organizing model elements & diagrams into groups. It provides an encapsulated namespace within which all the names must be unique. It is used to group semantically related elements. It is a namespace as well as an element that can be contained in other packages' namespaces. 2. Class: a representation of an object that reflects its structure and behavior within the system. It is a template from which running instances are created. Classes usually describe the logical structure of the system. 3. Interface: a specification of behavior. An implementation class must be written to support the behavior of an interface class. 4. Object: an instance of a class. It is often used in analysis to represent an artifact or other item.